Share the Journey - Lenten Solidarity Walk - Led by our Parish Youth! Thank you for joining us on our Share The Journey Walk around Sidney on March 10th. $620 was raised to help support Development & Peace. Many thanks to Carla and Stasia for leading the way with our Parish Youth. The walk highlighted the staggering reality of 68,5 million people in the world who are forced to leave their homes and fear for their lives. Each session is open to all. For continuity, we recommend that participants attend all four sessions. Please bring a bag lunch to each session; coffee and tea will be provided. A Certificate of Completion is provided to those who attend all four sessions. For more information, contact Moira King, Chair, Diocesan Health Care Committee, moiraking@shaw.ca. If you are planning to attend, please contact Fatima Warner, Visiting Ministry Coordinator at 250-656-8863 or email at bfwarner@shaw.ca We are hoping to arrange car pools. To register call (250) 592-7391 or email stpat190@telus.net. SESSION FOUR: Who Am I As A Pastoral Care Worker? Our Mass Schedule for the upcoming 7 days is available on every page of our website. All events (both parish & non-parish events) scheduled at the parish are displayed on our upcoming events "view calendar" (the "Week" or "Agenda" view is recommended). For address and contact information click on the "Contact" tab at the top of every page. Ad space is available on our website. 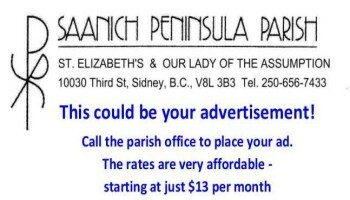 Please contact the parish office for more information and pricing.